The below maps shows Aoibheall’s movements based on satellite data transmitted via the Argos satellite system and is usually 1-3 days behind real time, depending on when it was downloaded. All information and maps courtesy of the Golden Eagle Trust. Always great to get reports of eagles as they disperse throughout Ireland. Occasionally some birds take it one step/wing-beat further and emigrate. 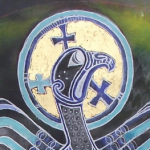 Eagles know no borders except perhaps for the barrier posed by flying over a large expanse of sea. Most migratory raptors, such as honey buzzards and some European eagles, use the shortest available sea crossing when heading south to Africa for the winter to maximise thermals for soaring over land. This makes watching raptor migration, and other large soaring migrants like White and Black Storks, at places like Tarifa (Spain), near Gibraltar, the Straits of Messina (Italy) and Bosporus (Turkey), some of the most exhilarating life experiences for a birder! While our eagles aren’t migratory as such many White-tailed Eagles disperse extensively in the first 2-3 years after fledging, using the island of Ireland as their ‘playground’ to explore! Undoubtedly some of this exploration helps individuals identify future potential breeding sites they may return to maybe years later to establish a territory and/or find a mate. The shortest sea crossing and exit out of Ireland is the short 20km of sea between Fair Head, Co. Antrim, and the Mull of Kintyre in south-west Scotland. So far, we know that at least six young Irish released White-tailed Eagles have visited Scotland in the last 10 years. One male released in Killarney in 2008 travelled all the way to the island of Westray in the Orkney Isles off the northern coast of Scotland in 2009 before returning to Kerry eight months later, a distance of 908km in a straight line from Killarney (see map)! With only another 450km across the North Sea and ‘home’ to Norway, male L (his tag letter) was 2/3rds of the way there! So, it wasn’t a total surprise to hear of another ‘Irish’ White-tailed Eagles in Scotland in the last month. But this time the bird was an Irish-bred youngster, the first eagle from an Irish nest to emigrate to Scotland. And the real surprise was that it was Aoibheall, the 2014 Mountshannon chick! On 20th September we got the exciting news that an eagle with her tag combination (orange/purple, tag no 2) had been seen on the Firth of Lorne in Argyll the previous day and had been in the area since 21 August! The last sighting we had of Aoibheall in Ireland was at Ballyallia lake, near Ennis, Co. Clare, on 4th April 2017. 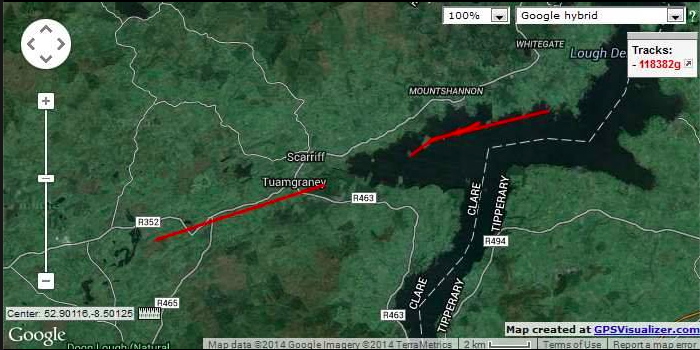 Since leaving Mountshannon on Lough Derg as a juvenile she travelled up the Shannon, spending the winter (2014/15) on the Little Brosna callows in south Offaly, before summering on Lough Ree (see map). Over the next two years she repeated this behaviour, wintering on the Little Brosna and summering on Lough Ree, until her movement away in 2017. We had/have high hopes that Aoibheall would be one of our first Irish-bred breeders and was our oldest ‘Irish’ female to date. So, the excitement of the news that she has been discovered alive and well on the west coast of Scotland is slightly tempered by the fact that she might well stay to breed ‘o’er the water’ and not on her home patch where every potential breeder is needed to boost the small and as yet tenuous Irish breeding population (10 pairs) versus the highly successful and growing Scottish population (c113 pairs in 2017, per Dave Sexton, RSPB). Time will tell whether the wanderer returns. Like 2008 male L, the Killarney breeding female (2007 X) also spend some months in Scotland in 2008 before returning. However, these were young juveniles whereas young Aoibheall is now in her 4th calendar year and as can be seen is now in mostly adult plumage (see pic). Her own female parent in Mountshannon nested for the first time at the same age, so no doubt Aoibheall is reaching maturity. Will she stay and hook up with a Scottish male? The odds seem to favour this with many more eagles available in Scotland outside the already established breeders. One of our Killarney released females (2007 release) has already been breeding in Argyll since 2014. But I guess we should take a holistic view on this! Wherever she stays to breed will be a boost to the greater ‘Celtic’ (not in the football sense) population and, someday soon, hopefully both Irish and Scottish breeding populations will function as one large population where individuals move and breed freely along the western seaboard, and beyond, restoring the ‘Celtic Isles’ population to something akin to it’s former self when as many as 800-1,400 pairs were estimated in historical times (Evans et al. 2012). Wouldn’t that be a legacy worth leaving! Thanks to David Ainsley of Sealife Adventure tours In Argyll for the great photo and news! The last recorded movement was close to Lough Ree, in Co. Longford. The transmitter was located on the ground, shortly after the reading remained static. The chick can now only be recognised by her orange wing tag. The located transmitter is now fitted to this year’s chick. After heading north in mid-winter from her natal site on Lough Derg she spent the first couple of months of 2015 on the Little Brosna callows in south Offaly. This area is a haven for wildfowl in winter, teeming with waders and duck, with lots of nice wooded areas to roost in. 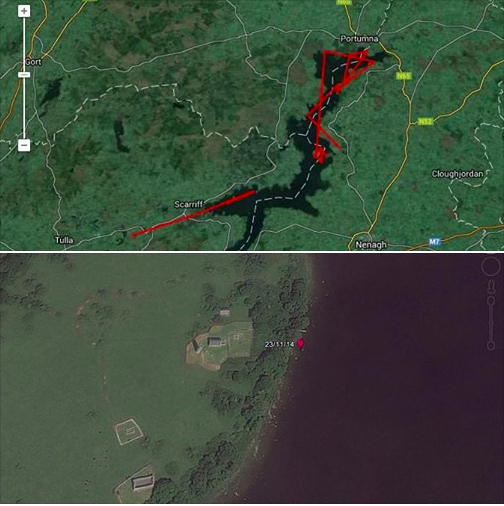 Finally on 7 Apr she headed north in Co Roscommon, then north into Longford on 14 Apr, returning to the area around Lough Funshinagh, Co. Roscommon…..the lake that dissappears!! Brief Update on Aoibheall’s Tour of the Provinces! After spreading some time around Portumna, North Lough Derg, in December, Aoibheall is now moving around the flooded lowlands and bogs between South Offaly and North Tipperary. As the spring approaches it will be interesting to see if she disperses further up the Shannon toward Lough Ree or returns to Lough Derg? Aoibheall is now moving up the Shannon and is just in the south on Offaly south-west of Banagher. She’s been there the past week after a long spell around Portumna. Lots of flooded areas round the Shannon so should be good hunting. Over the last four and a half months or so since she took her first flight from her nest high up in a Scots Pine near Mountshannon, Co. Clare, its been fascinating to see the 2014 WTSE chick Aoibheall explore her watery environment on beautiful Lough Derg. Over the first four months she has been pretty much a ‘homebird’ staying within a kilometre or two of her natal area most of the time and only very occasionally (13-15 Oct) roosting away from Mountshannon. All that began to change in late November. On 23/11 she roosted for the very first time on Inis Cealtra (Holy Island) within a stone’s throw of the ancient round town and monastic settlement founded originally back in the late 7th Century by St. Caimin (hence the name of Aoibheall’s male parent!). Perhaps she was looking for the ancient ones blessing before she headed off on her travels?! 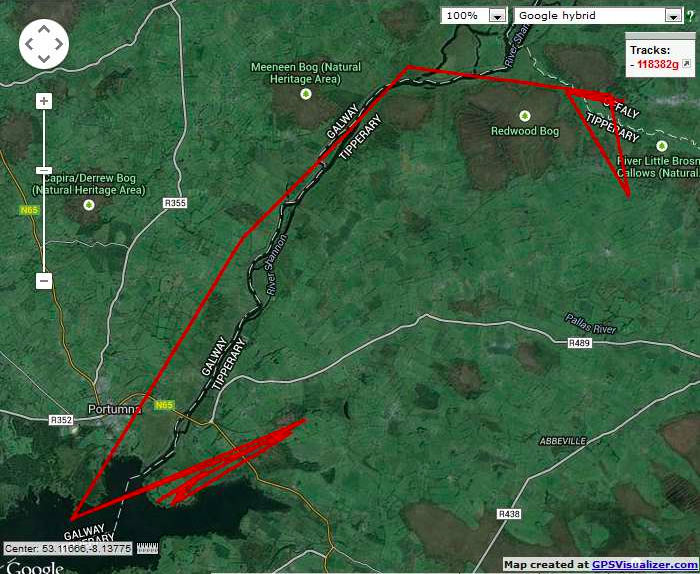 On 25/11 she had left Lough Derg for the first time and travelled 15km west to roost between Bodyke and Tulla. Coincidentally, on the very same day, Caimin (the Mountshannon male WTSE) was spotted by NPWS ranger Áine Lynch at Parteen Weir 18km south of Mountshannon and downriver from Killaloe. Over the years we’ve never had either adult this far from their territory. No distance for an eagle for sure but perhaps Aoibheall started her journey once he left? As in 2013 the adult male has shown what a brilliant parent he is. 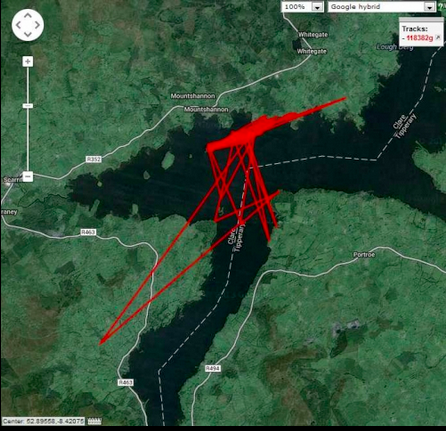 On 26/11 Aoibheall returned east to roost in Raheen Wood near Tuamgraney on the edge of Lough Derg and next day was back in the nest area where she remained until at least late on 30/11. Although there was a gap in the GPS data over the next two days (due to low light levels resulting in the solar powered battery losing charge), by mid-day on 2/12 she had moved half way up the lake on the Tipp shore before roosting 12km north on the Galway side of the lake. 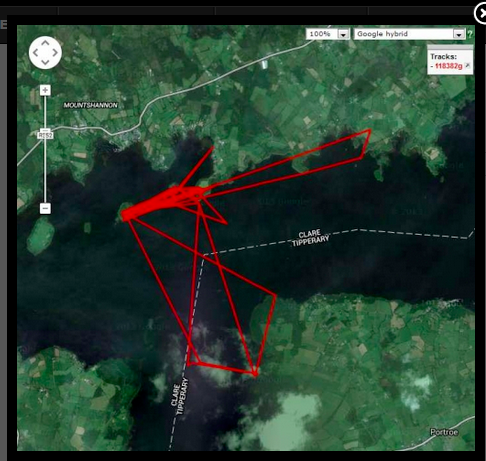 Over the last 10 days she has been exploring the north end of the lake from Dromineer to Portumna (see map of her GPS tracks). 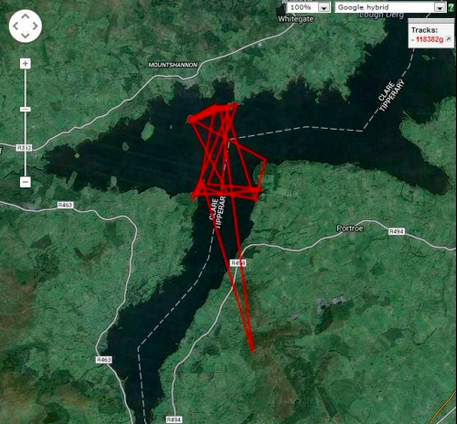 Not only has the GPS data been brilliant at tracking her movements it’s been exciting (and a little nerve-wracking!) to see her first-hand coping so well in the wild. On 5/12 she cruised all round the north end of the lake from Terryglass to Portumna and back, landing for a while on some of the islands. On 10/12 she spent over an hour soaring and hovering into the teeth of a gale. Looking at her she seemed to revel in it. She could have landed at any time but hey, landings for wimps (! ), only descending to cover when a big wintery shower hit the lake. At one point she was mobbed by a male Kestrel, looking for all the world like a gnat in her presence. Following that a young Peregrine falcon joined in the fun and began dive-bombing her before heading off south. It’s going to be interesting to see how long she stays on the lake and whether she returns to base in Mountshannon at any time or just keeps on going. Over the last few weeks Aoibheall (2014 Mountshannon chick) has been very settled in and around its nest area and showing little sign of making a big movement away. She did make it a few km east along the shore towards Whitegate but soon returned to her usual haunts. Last weekend she visited Inis Cealtra (Holy Island) for the first time and roosted there overnight which is remarkable given how close it is to where she was hatched. Last week all three, parents and chick, could be heard calling excitedly on the offshore islands from Mountshannon pier. Maybe parents know something is up and it’s time for Aoibheall to spread her wings?! Last Tuesday (25th Nov) one of her parents, male Y (Caimin) was spotted by N Tipperary NPWS ranger Aine Lynch at Parteen weir south of Killaloe, 18 kilometres south of Mountshannon! Of course 18km is nothing for a White-tailed Sea Eagle, but given how faithful they are to their breeding ranges this was quite a trip away. 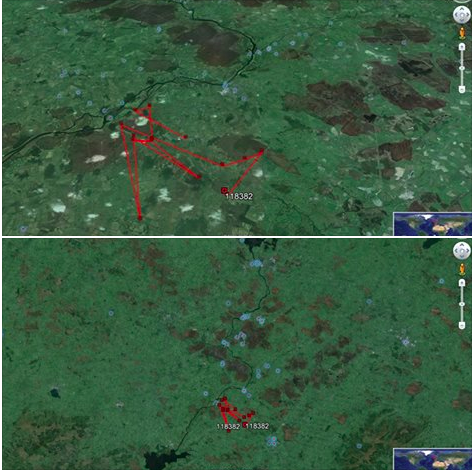 Finally in the last few days Aoibheall took off and headed west inland roosting overnight between Tulla and Bodyke (25/11), the same day Caimin was at Parteen….coincidence? The next day she headed back to roost near Tuamgraney, on the edge of Scarriff Bay. By now she may be back home but we will know more soon. Aoibheall has been making some nice flights south and south-east to the Tipperary shore and also one flight east towards Williamstown. The autumn weather is still pretty mild and windy but the days are getting shorter as we lead into the winter. Aoibheall is showing all the signs she might spend the winter on Lough Derg. Since she fledged from her nest on Lough Derg on 26 July, WTSE chick Aoibheall has been slowly expanding her range and exploring her environment. She made one trip 9 kilometres south-west to the edge of the Slieve Bernagh mountains in south-east Clare and more recently visited the Tipperary side of the lough. However she still seems keen to return to base most days near Mountshannon where her parents, Caimin (2008 red tag Y) and Saoirse (2009 green tag %) are still no doubt bring her fish. The 2013 chicks left the area on or around the end of September so it’ll be interesting to see how long she stays around. Maybe being an ‘only chick’ she will stay much of the winter, having no competition for food and parents who are still attentive. The map shows her movements based on satellite data transmitted via the Argos satellite system and is usually 1-3 days behind real time, depending on when it was downloaded.